Epic Asian is a content creator who does funny commentary on movies and videos with an Asian twist to it. He currently a social media following with over 90,000 in Facebook and over 10,000 in YouTube. If you’ve been on Facebook lately, you’ve probably come across his content, especially the one about the new iPhones and the 2-minute Crazy Rich Asians parody—both of which have millions of views. 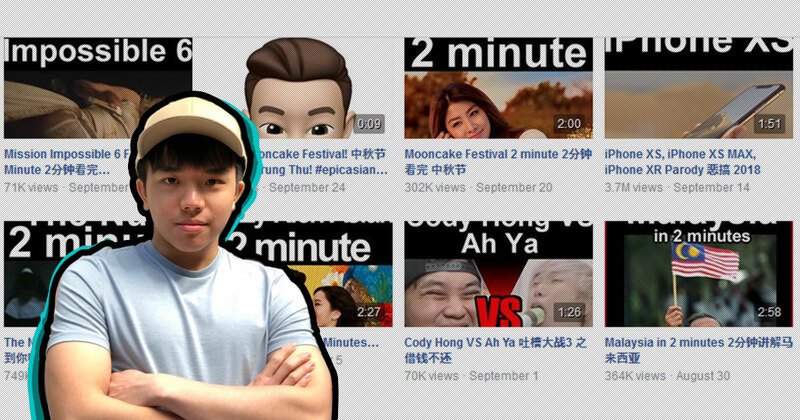 The person behind these viral videos is an individual who only wants to be known as Epic Asian. Epic Asian began his journey on Facebook without any background in video editing, and learned everything from scratch. Now, runs his page by himself, taking care of video content in addition to replying to comments and other social media matters. But that’s not to say that he hasn’t received help from elsewhere. “Along the way, I received help from a really important person in my life and my brother. They helped me voluntarily, in ideas and replying comments, but are still committed to their own commitments,” he added. Currently, Epic Asian is 23 years old and although we know what he looks like, we still don’t know his real name. For him, this works just fine as the page is more of a passion project (he doesn’t earn from his productions), with him having commitments to focus on. As for his content, Epic Asian believes that people enjoy the way he speaks English, or rather his heavily Malaysian-ised version of the language. And to spice things up, he also adds the familiar Hakka/Hokkien dialects and slangs in his commentary as he finds it funny and relatable, all this despite not having the chance to pick up the Chinese language due to him undergoing private schooling. Everything he’s learned, he picked up from his friends and relatives. After 5 months, Epic Asian has a total of over 90,000 likes on Facebook and 10,000 subscribers on his YouTube channel, and he hopes to pass the 100,000 milestone on Facebook eventually. But for now, he’s happy with things the way they are, even with his other challenges in real life. However he understands that it’s all part of the business of content creation, especially with social media involved, and he just takes it all with an open heart. “I wasn’t particularly affected to be honest. I take them as genuine criticisms to improve. I’m grateful that many people find my videos funny now,” Epic Asian said. And if you are a budding content creator looking to make it big in the scene, Epic Asian has a few words of advice for you. If you would like to know more about Epic Asian, you can check out his Facebook page here and YouTube channel here.